For 2016, the Mazda CX-5 receives a refresh in the form of minor styling tweaks, improved interior materials, revised suspension tuning, added sound insulation and an updated infotainment interface. New options include LED headlights, adaptive cruise control, rear cross-traffic alert and lane departure warning, while Bluetooth is now standard across the board. Additionally, a midyear update brings separate 2016.5 models (production after January 2016) that include a standard rearview camera (except manual-transmission Sport), standard heated seats for the Touring trim and standard navigation for both Touring and Grand Touring. Sporty driving feel that makes you feel secure while cornering; engines earn great fuel economy; spacious seating in both rows; many desirable safety features. With their ample cargo capacity, good fuel efficiency, elevated driving positions and enhanced foul-weather driving capability, compact crossover SUVs have massive appeal. Indeed, this is one of the most popular vehicle segments. And within that crowded class, the 2016 Mazda CX-5 stands as one of our favorite picks. What pushes this Mazda to the front of the class is that, in addition to satisfying those core requirements, it also boasts a nicely trimmed cabin, excellent safety ratings, a smooth and quiet ride, comfortable seats and good visibility. The CX-5 also has something quite rare in this segment: a fun-to-drive personality that comes by way of its precise steering and sporty handling. With the bigger engine that's standard on most trim levels, the CX-5 also provides an impressive combination of peppy acceleration and high fuel economy. Whether you're driving to work, running errands or dropping the kids off somewhere, the 2016 Mazda CX-5 is enjoyable to drive and as comfortable and easy to live with as a favorite pair of jeans. Those traits also make the CX-5 a great road trip companion. We think the 2016 Mazda CX-5 is one of the best crossovers on the market. For 2016, Mazda has updated the CX-5 in a few areas. Refinements include styling tweaks to the front and rear ends, an electronic parking brake, added sound insulation for reduced road noise, an updated infotainment system and revised suspension tuning for a more comfortable ride. There's also more cabin storage thanks to larger door pockets and a bigger console bin. Mazda improved the seats as well, with the backseat gaining a larger seat-bottom cushion. If you're looking for a weak spot in this generally excellent package, the main one is the base 2.0-liter engine found on the Sport trim level with the manual transmission. It's pretty low on power and, although it's quite fuel-efficient, it has a negligible advantage over the significantly better-performing 2.5-liter engine. If full passenger loads and/or hilly driving are in your plans, we certainly recommend the available 2.5-liter engine. In addition, the Mazda CX-5's sound systems are subpar. Even the uplevel Bose system delivers unimpressive audio quality. There are a lot of good choices in the small crossover class, so it's worth checking out your options before making a decision. The Honda CR-V has lots of space, a high-quality interior and a likable, easygoing driving demeanor. It's not as athletic as the CX-5, but it's an equally desirable choice. There's also the Ford Escape, which has a top-notch interior as well as the option of a powerful, turbocharged engine. The Toyota RAV4 boasts a roomy cabin and is especially comfortable on the highway. For those interested in a small crossover SUV that can handle the occasional off-road excursion, we recommend looking at the Jeep Cherokee and Subaru Forester. While each of these competitors has certain advantages, the 2016 Mazda CX-5 is one of the best all-around vehicles in this segment and deserves strong consideration. The 2016 Mazda CX-5 is a five-passenger compact crossover SUV available in Sport, Touring and Grand Touring trim levels. All trim levels offer a choice of front-wheel drive (FWD) or all-wheel drive (AWD). The base Sport with the 2.0-liter engine and manual transmission comes standard with 17-inch alloy wheels, full power accessories, air-conditioning, cruise control, a height-adjustable driver seat, a tilt-and-telescoping steering wheel, a 60/40-split folding rear seat, Bluetooth phone and audio connectivity and a four-speaker sound system with a CD player, auxiliary audio jack and an iPod /USB interface. There's also a Sport variant with the larger 2.5-liter engine and an automatic transmission. Its standard features expand to include a 7-inch touchscreen interface, a multifunction controller knob, HD radio, Pandora Internet radio, automatic crash notification, SMS text message reading and audio system voice controls. For the 2016.5 model, a rearview camera is also standard; it's optional on the earlier 2016 version. The Touring includes all of the above as well as foglights, keyless ignition and entry, blind spot and rear cross-traffic warning systems, a six-way power driver seat, a height-adjustable passenger seat, a 40/20/40-split folding rear seat, upgraded cloth upholstery, a leather-wrapped steering wheel and a six-speaker sound system. The Moonroof and Bose Audio option package adds a sunroof and an upgraded nine-speaker Bose audio system. The Grand Touring includes all of the above plus 19-inch wheels, automatic headlights, automatic windshield wipers, heated mirrors, dual-zone automatic climate control, satellite radio, heated front seats and leather upholstery. Leather upholstery comes standard on the CX-5's Grand Touring trim. Available on both the Touring and Grand Touring is the Technology package. It features a navigation system, the Smart City Brake Support System (see Safety section for more details), adaptive LED headlights, LED running lights, LED foglights, LED taillights and an auto-dimming rearview mirror. On the Touring, it also includes automatic headlights and automatic windshield wipers. Optional on the Grand Touring is the i-ActiveSense package that includes adaptive cruise control, Smart Brake Support (see Safety section), lane departure warning and automatic high beam headlight control. Note that the 2016.5 CX-5 Touring trim gets the heated front seats as standard, while both the 2016.5 CX-5 Touring and the 2016.5 CX-5 Grand Touring come standard with the navigation system. Otherwise, the content of the optional packages is unaffected. The front-wheel-drive 2016 Mazda CX-5 Sport comes with a choice of two powertrains. You may choose either a 2.0-liter four-cylinder engine with 155 horsepower and 150 pound-feet of torque matched to a six-speed manual transmission, or a 2.5-liter four-cylinder engine with 184 hp and 185 lb-ft of torque paired with a six-speed automatic transmission. All-wheel drive is optional on Sport models with the 2.5-liter engine. The bigger engine is standard on Touring and Grand Touring models. The EPA's estimated fuel economy for the Sport FWD, 2.0-liter version is 29 mpg combined (26 city/35 highway). All FWD CX-5s with the 2.5-liter engine earn an identical 29 mpg combined (26/33), while those with all-wheel drive (AWD) rate 26 combined (24 city/30 highway). In Edmunds testing, a CX-5 with the 2.5-liter engine and AWD accelerated from zero to 60 mph in 8.0 seconds, which is a very respectable performance for this class. Every 2016 Mazda CX-5 comes standard with antilock brakes, stability and traction control, front side airbags and side curtain airbags. An automatic crash notification feature is optional on the Sport and standard on the Touring and Grand Touring, which also get blind spot and rear cross-traffic warning systems. Available on the Touring and Grand Touring, the Smart City Brake Support system uses a laser sensor to detect stationary objects (such as stopped cars or pedestrians) in front of the vehicle at speeds up to 19 mph. If the driver fails to respond to a warning, the CX-5 can automatically apply the brakes. The Grand Touring can also be had with the i-ActiveSense package that features adaptive cruise control, Smart Brake Support (allows automatic braking from higher speeds than the City system), lane departure warning and automatic high beam control. On automatic-equipped CX-5s, remote door locking is possible via the optional Mazda Mobile Start smartphone app service. In Edmunds brake testing, a CX-5 Grand Touring came to a stop from 60 mph in 121 feet, which is a bit better than average for the class. In government crash testing, the CX-5 received a four-star rating for overall crash protection, with four stars for frontal-impact protection and five stars for total side-impact crash protection. In crash testing by the Insurance Institute for Highway Safety (IIHS), the CX-5 earned the highest possible rating of "Good" in the moderate-overlap frontal-offset, small-overlap frontal-offset, side-impact and roof-strength tests. Its seat/head restraint design was also rated "Good" for whiplash protection in rear impacts. Regardless of the trim level, the cabin of the Mazda CX-5 is attractive, modern and functional. It's a mature design, and it isn't swathed in poorly rendered fake wood or highly reflective chrome trim. Instead, materials are simple and high in quality, and soft-touch surfaces are set off with tasteful metallic or piano black accents. The CX-5's black gauges with white lettering are also highly legible. The 2016 version of the CX-5 brings a much-improved infotainment system. Boasting a 7-inch (versus the previous 5.8-inch) screen and an intuitive multifunction control knob, the new system is one of the better ones out there. Most drivers should be able to find a good driving position, and front-seat comfort is excellent on long road trips. Mazda has added an improved infotainment system to the 2016 CX-5. The Mazda's backseat is spacious and offers plenty of legroom for this class. That rear seat features an innovative folding mechanism on the Touring and Grand Touring trim levels that lowers the seat bottom before folding the seatback on top to provide a near-flat load floor. With all seats occupied, there are 34.1 cubic feet of luggage space. That grows to a competitive 64.8 cubic feet with the rear seats folded. 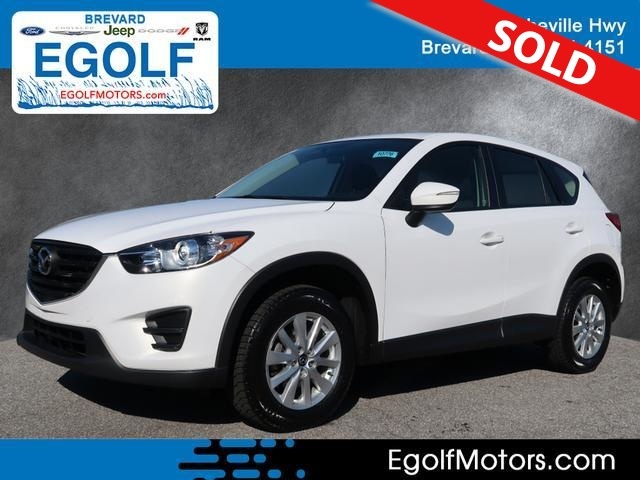 Equipped with the base 2.0-liter engine, the Mazda CX-5 offers competitive power on paper, but it just doesn't feel that strong during merging and passing maneuvers in the real world. For the majority of small crossover shoppers, the 2.5-liter four-cylinder is a much better choice given its superior power and virtually identical fuel economy. Furthermore, the six-speed automatic shifts quickly and smoothly and is one of the most responsive transmissions in this class. Mazda still makes a very good manual transmission, but given that it's only available with the 2.0-liter engine, its appeal is quite limited. Easily the most striking thing about the 2016 Mazda CX-5 is its athletic character. Even if you're just looking for a small crossover to drive to work every day, you'll notice that its steering, brakes and suspension are uncommonly capable for a vehicle in this class. It's an enjoyable vehicle to run errands in, and if you happen to turn onto a road with twists and turns, the CX-5 can be downright fun. On the highway, the Mazda rides just as comfortably as most other crossovers, making it a fine road trip companion.